For the World War II battle, see Kokoda Track campaign. Map of the Kokoda Track as it was in 1942. The map is rotated to have NE bearing at the top of the page. The Kokoda Track or Trail is a single-file foot thoroughfare that runs 96 kilometres (60 mi) overland – 60 kilometres (37 mi) in a straight line – through the Owen Stanley Range in Papua New Guinea. The track was the location of the 1942 World War II battle between Japanese and Allied – primarily Australian – forces in what was then the Australian territory of Papua. The track runs from Owers' Corner in Central Province, 50 kilometres (31 mi) east of Port Moresby, across rugged and isolated terrain which is only passable on foot, to the village of Kokoda in Oro Province. It reaches a height of 2,190 metres (7,185 ft) as it passes around the peak of Mount Bellamy. The track travels primarily through the land of the Mountain Koiari people. Hot, humid days with intensely cold nights, torrential rainfall and the risk of endemic tropical diseases such as malaria make it a challenging trek. Hiking the trail normally takes between four and twelve days; the fastest recorded time is 16 hours 34 minutes. The colonial government, having received messages of the surveyor's obstacles, sent Capt. Charles Monckton to resupply the group with food, ammunition and troopers of the Native Constabulary. Monckton reached the surveyor's camp finding that they were barricaded in a log hut surrounded by local tribesmen. Monckton's force "swept away the surrounding natives" and as soon as "the rifle fire died away" they were able to unite with Stuart-Russell's group. Stuart-Russell also discovered gold in the area which encouraged British and Anglo-Australian prospectors to enter the region that was to become known as the Yodda Kokoda goldfields. 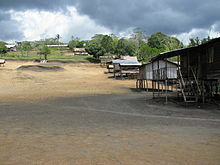 Due to conflict between these miners and the local tribes, the colonial paramilitary force, the Armed Native Constabulary, was ordered to enforce British rule in the region. From 1900, officers such as William Armit, Alexander Elliot and Archibald Walker led their troopers to crush any opposition, killing many villagers. Armit, who was previously a sub-inspector in the notorious Native Police force in Queensland, alone led a patrol that shot dead seventeen people in one village in the upper reaches of the Mambare River. In 1904, the colonial management decided to establish a government settlement to act as a base for the troopers and consolidate British rule. This station became known as Kokoda and from this base the Armed Native Constabulary was able to subdue the local population. Paths from Kokoda were made with forced labour from local and distant tribes. Government officer, Henry Griffin ordered that those who refused to labour were to be punished with the shooting of their pigs and stealing of their taro plants. Between July 1942 and November 1942, a series of battles, afterwards called the Kokoda Track Campaign, were fought between the Japanese and Australian forces. This action was memorialised in the newsreel documentary Kokoda Front Line!, filmed by cameraman Damien Parer, which won Australia's first Academy Award for its director Ken G. Hall in 1942. After the war, the track fell into disuse and disappeared in many places. John Landy, the long-distance runner, set a record of four days for the crossing using carriers and guides during the 1950s, and in 1964 Angus Henry, the art teacher at Sogeri High School, along with two of his students, John Kadiba and Misty Baloiloi, set a new record which was to stand until after the millennium by completing the journey in three and a quarter days without guides, carriers or any signposts or bridges. In 2006, the Owen Stanley Ranges and Kokoda Track was included on the Tentative List for World Heritage along with three other sites from PNG. The 1.5 million hectare property is a mixed cultural and natural site covering a significant proportion of the Owen Stanley Ranges and including the Kokoda Track, Managalas Plateau and Mount Victoria and Mount Albert Edward region. The World War II battle sites were a key reason for cultural listing along with the unique cultures of the Koiari peoples. The Owen Stanley Ranges, through which the Kokoda Track passes, is one of the most biologically important areas in the Asia Pacific with over 4000 plant species and many endemic bird and animal species. The Kokoda Track Foundation, established in 2003, helps villages along the track with education and healthcare. There is a proposal to turn the track into an Australian heritage destination on a par with ANZAC Cove at Gallipoli. Creation of the heritage area, is in part a response to the issue of an Australian gold mining company wanting to mine on or near the track. As of 2007[update], the idea was backed by the Australian government and Papua New Guinea's foreign minister. In November 2007, Australian mining firm Frontier Resources announced plans to divert a section of the track to make way for a copper mine. The plan has the support of the local landowners and the Papua New Guinean government but has been criticized by trekking operators. The track has been closed numerous times by villagers along the route in response to various grievances. In May 2009, villagers at Kovelo – near Kokoda village – blocked the track after complaints that money collected from trekking fees was not being distributed fairly. Since 2001, there has been a rapid increase in the number of people walking the track (see table at right). Six Australian trekkers have died from natural causes while attempting to walk the track. Four of those deaths occurred in 2009, with two in the same week in April and another two 8 days apart in September and October. The deaths have sparked calls for mandatory fitness tests for all walkers before starting. As popularity for walking the track has increased, there have been calls for more regulation of trek operators with some operators taking as many as 150 walkers in a group. In response the Kokoda Track Authority has announced that from the beginning of 2010, tour operators must have a commercial licence which will "address things such as training requirements and first aid details". In August 2009, the Kokoda Track was the destination for a group of trekkers that were killed when their light plane, Airlines PNG Flight 4684, crashed en route to Kokoda Station. All 13 people on board, including 9 Australian trekkers, were killed in the crash. As a result, the Australian Government committed $1.8 million to improve safety along the track. Funds would be used to improve the safety of airstrips at Kokoda, Menari, Kagi, Melei, Efogi, and Naduri, villages located along the track. A second radio channel would also be installed to deal with emergencies and maintenance work. In October 2009, Don Vale became the oldest Australian (at 83) to successfully complete the Kokoda Track. In November 2009, Australian paralympian Kurt Fearnley (born without the lower section of his spine ) completed the track, crawling north to south, in 11 days. A multiple paralympic gold medalist (T54 Marathon in Athens and Beijing), he used customized shin pads and wrist guards. His journey was to raise awareness of men's health issues and was inspired by the story of Corporal John Metson, who crawled the track for three weeks, refusing the assistance of a stretcher on the grounds it would burden his comrades. There has been much debate in Australia about whether it should be called the "Kokoda Trail" or the "Kokoda Track". The monument at Owers' Corner uses both terms: "Track" on one side and "Trail" on the other. "Kokoda Trail" was gazetted as the official name of the route by the Australian administration of Papua New Guinea in 1972. The earliest mention of the route in an Australian newspaper may be in The Argus on Wednesday 29 July 1942 in a map when it refers to "the Buna Kokoda-Moresby track". According to historian Stuart Hawthorne, before World War II, the route was referred to as "the overland mail route" or "the Buna road". He states that "Kokoda Trail" became common because of its use in Australian newspapers during the war, the first known instance being in Sydney's Daily Mirror on 27 October 1942. However, all three terms Kokoda Track, Kokoda Trail and Buna-Kokoda road were commonly used during World War II in Australian newspapers from September 1942. The diary of the Australian Army's 2/33rd Battalion records the route being officially designated as the "Kokoda Trail" in September 1942. The Australian Army has used "Kokoda Trail" as a battle honour since 1957. The Australian War Memorial (AWM) says that "trail" is probably of United States origin but has been used in many Australian history books and "appears to be used more widely". Despite the historical use of "Trail", "Track" gained dominance in the 1990s, with the Australian Macquarie Dictionary stating that while both versions were in use, Kokoda Track "appears to be the more popular of the two". The track can be walked from either direction. Some say that from Kokoda to Owers Corner is easier, even though in that direction one must actually climb an extra 550 metres in height. The track can take anything from 4 days to 12 days to complete, depending on fitness and rest time involved. Locals are renowned for being able to regularly complete it in 3 days. The best time to trek Kokoda is from April to September, during the 'dry' season. There are a number of guesthouses located along the way, some at villages and others at traditional rest spots. The main villages passed through (from Owers' Corner) are Naoro, Menari, Efogi Creek 1 & 2, Kagi or Naduri (if shortcut is taken), Alolo, Isurava, Hoi, Kovolo. Villagers are increasingly taking part in the commercial opportunities created by the growing number of tourists; in October 2006, some were known to be selling cans of soft drink and beer at double the price payable in Port Moresby. Guides and porters can be found more easily at the Kokoda end of the track by asking the local police station for a reputable person. The Kokoda Track Authority (the PNG Special Purpose Authority with responsibility for managing the Track) requires tour operators to hold a Commercial Operators Licence to lead treks along the Kokoda Track and purchase a trek permit. Licensed operators carry first aid kits, undertake first aid training, carry radios and/or satellite phones, respect the people who live along the Track and ensure their porters and guides are treated in a professional manner. A list of licensed operators is available on its website. Trekkers walking with unlicensed operators will be stopped by the KTA Rangers and the local people. The Kokoda Challenge Race is an endurance running race that was revived on 27 August 2005. The race originally ran in 1975 but stopped before becoming an annual event. The Kokoda Challenge inaugural race commenced in 2005. The current race record holder in both directions is Brendan Buka, with a best time of 16:34.05 in 2008 from Owers Corner to Kokoda and a time of 17:20 in the direction of Kokoda to Owers' Corner via Naduri. The inaugural race of 27 August 2005 was won by John Hunt Hiviki, who completed it in 22 hours, one minute and 14 seconds. On 27 August 2006, Brendan Buka, a 22-year-old Papua New Guinean trekking porter from Kokoda, conquered the trail from Owers' Corner to Kokoda in a winning time of 17 hours, 49 minutes and 17 seconds. A Sydney engineer, Damon Goerke, 32 became the first Australian to run the track in under 24 hours, coming third in the 2006 challenge with a time of just under 19.5 hours. On 31 August 2008, Buka once again rewrote the record books by winning the 2008 race with a time of 16:34:05. The conditions were the worst that they had been in the three years that Buka had competed in the event. That year, Buka trained, which is why he claims he broke his own record. Wayne Urina, claiming second place, is currently the 2nd fastest man to complete the crossing of the Kokoda Trail with a time of 18:34:06. Cyprian Aire came third with 19:11:40. In 2011, the Kokoda Challenge Race was run on 27 August. The race commenced from Ower's Corner and finished at the new Kokoda Archway. The race was organised and sponsored by Kokoda Trekking. Brendan Buka once again won the race in a time of 17:50:33 but did not break his previous record set in 2008. The Kokoda Challenge Race in 2012 was run on 25 August. The race commenced from the Kokoda Archway and went for the first time via Kagi Village and finished at Owers' Corner. The race once again was sponsored by Kokoda Trekking. This year saw a new champion emerge by the name of Ramsy Idau of Kokoda (who walks the Kokoda Trail as a porter with Kokoda Trekking), set a new record with a time of 18:28:00. Prize money was set at K10,000 PNG Kina. In the race there were several top class competitors from Australia, Damon Goerke (returning for a second time); Richard Mountstephens; Chris Wight (nephew of Stan and Butch Bissett 2/14th); Jonathan O'Loughlin; Chris Turnbull; Andrew Turner and Dave Jennings. William Bennett also competed in his second Kokoda Challenge Race and finished in a time of 31:09:10. The race was a successful event which also saw for the first time two Japanese runners compete against the 8 Australians and 22 Papua New Guineans in this the 70th Anniversary of the Kokoda Campaign. The two Japanese runners, Makoto Yoshimoto and Yukiya Higuchi finished in a time of 42:56:36. ^ Pérusse, Yvon (July 1993). Bushwalking in Papua New Guinea (2 ed.). Hawthorn, Victoria, Australia, Berkeley, Calif: Lonely Planet. p. 98. ISBN 978-0-86442-052-7. ^ Hank Nelson (19 July 2016). Black, White and Gold: Goldmining in Papua New Guinea 1878–1930. ANU Press. pp. 105, 120. ISBN 978-1-921934-34-6. ^ Monckton, C.A.W. (1921). Some experiences of a New Guinea resident magistrate. London: John Lane. p. 160. ^ Nelson, Hank (1976). Black, White and Gold. Canberra: ANU Press. ^ a b "Kokoda 'heritage' a step closer". Brisbane Times. Fairfax. 18 May 2007. Retrieved 8 July 2011. ^ a b "Mining firm urged to leave Kokoda Track alone". News Online. Australian Broadcasting Corporation. 1 November 2007. ^ Fox, Liam (8 May 2009). "Disgruntled villagers block Kokoda Track". Online News. Australian Broadcasting Corporation. Retrieved 12 May 2009. ^ a b Ellie Harvey (21 April 2009). "Kokoda death highlights safety concerns". The Sydney Morning Herald. p. 1. ^ "Kokoda Trail tour operators fear 'cowboys' walk among them". The Sydney Morning Herald. Sydney. 22 April 2009. Retrieved 8 July 2011. ^ a b "Deaths spark calls for Kokoda conduct code". Online News. Australian Broadcasting Corporation. 24 April 2009. Retrieved 25 April 2009. ^ "Another Australian dies on Kokoda Track". Online News. Australian Broadcasting Corporation. 5 October 2009. Retrieved 6 October 2009. ^ "Kokoda trekkers 'should pass fitness tests'". Online News. Australian Broadcasting Corporation. 5 October 2009. Retrieved 6 October 2009. ^ Mark, David (24 April 2009). "Kokoda 'cowboys' endangering lives, operator says". The World Today. Australian Broadcasting Corporation. Retrieved 25 April 2009. ^ a b "No survivors in PNG plane crash". News Online. Australian Broadcasting Corporation. 12 August 2009. Retrieved 12 August 2009. ^ "Fearnley conquers Kokoda Track". ABC News. ^ a b "Kokoda Track or Kokoda Trail?". Kokoda Trekking. Retrieved 16 January 2007. ^ James, William M. (2006). Field Guide to the Kokoda Track: an historical guide to the lost battlefields (R/P ed.). Lane Cove, N.S.W: Kokoda Press. pp. 40–41. ISBN 0977570401. ISBN 978-0977570409. ^ "Encyclopedia: Kokoda Trail". Australian War Memorial. Retrieved 16 January 2007. ^ Macquarie Dictionary (4 ed.). 2005. p. 791. ^ AAP (24 August 2007). "Three Aussie women in Kokoda Track race". The Sydney Morning Herald. ^ "Kokoda Trekkers Hall of Fame". kokodatrail.com.pg. Retrieved 5 March 2007. ^ "PNG local sets new Kokoda track record". ABC News Online. 27 August 2006. Retrieved 5 March 2007. ^ a b Jones, Lloyd (27 August 2007). "PNG trekking porter sets Kokoda record". news.com.au. ^ Fitzsimmons, Peter (19 October 2007). "Between a rock and a hard place". Sydney Morning Herald. Retrieved 19 October 2007. ^ "Kokoda Challenge 2008 Race - Completed, 30th - 31st August 2008". kokodatrekking.com.au. 31 August 2008. Retrieved 21 April 2009. Baker, Clive (2006). Kokoda Trek: A Walking Guide to the World Famous Trek. Loftus NSW: Australian Military History Publications. James, William M. (2012). Field Guide to the Kokoda Track: An Historical Guide to the Lost Battlefields (3rd Edition). Lane Cove, N.S.W: Kokoda Press. Wikivoyage has a travel guide for Kokoda Track. This page was last edited on 27 March 2019, at 00:35 (UTC).